Our exploration of on-die power-rail measurements has brought us to the point of demonstrating some examples of these measurements. As noted in the prior post, we will use an Atmel 328 microcontroller demo board, prepared with firmware to control it explicitly for our purposes, and with coaxial cable in place on the bottom of the board to serve as transmission lines for our signals of interest. Test equipment for these examples will be a Teledyne LeCroy HDO8108A oscilloscope and three Teledyne LeCroy RP4030 active voltage-rail probes. Let's first describe the setup of our instrumented demo board. One I/O (pin 8) will be toggled as a trigger for the oscilloscope to give us a reference for subsequent operations. The trigger is set up as one clock cycle high and low. So as not to load that line down with a 50-Ω input impedance, we have a 450-Ω resistor in series with the tip. Thus, it's going to give us 10X attenuation, but given that it's only triggering the oscilloscope, we don't care about SNR for this signal. Some other pins (pins 9 and 10) will be loaded with either the 50-Ω or the 1-MΩ inputs to the oscilloscope so we can turn that load on and off and see the impact of extra I/O current on the die. Pin 11 will be our quiet-low pin connected to Vss on the die and monitored with a voltage-rail probe. Meanwhile, pin 12 will be our quiet-high pin connected to Vcc on the die and similarly monitored. Both of these pins come off the board into a coaxial transmission line and straight into the rail probes. We'll also monitor the 5-V line on the demo board itself. Several other pins are configured to drive LED loads that we can toggle on and off and see the impact of these loads on the rails. For this example, the microcontroller's clock rate is 16 MHz (1 cycle = 60 ns). When the DUT is in the idle state, nothing will be happening on the die save for the toggling of the trigger pin. So in that state, we can look at the on-board power-distribution network's (PDN's) noise level as well as some noise emanating from a switch-mode power supply and a low-dropout regulator. There's the clock that will be continuously running background maintenance functions for the MCU. 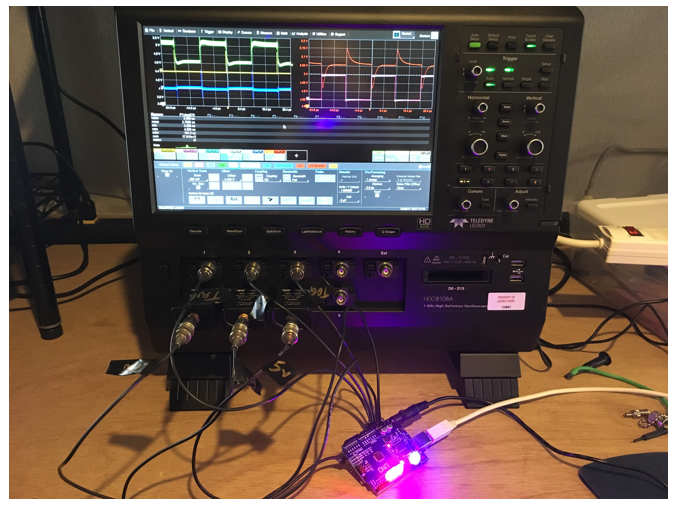 And, of course, we'll want to observe how the on-die power rails (Vcc and Vss) react to I/O switching with sagging and ground bounce, as well as how the on-board power supply handles switching transients. Next, we'll describe what we expect to see in these measurements and have a look at the measurements themselves to see if they correlate with expectations.